Age in Place: Are nursing homes really a safe place for seniors? There comes a time when your parents, grandparents or other relatives, and close ones who reach their senior age need special care and professionals that can provide it, due to various medical conditions or just for the specific needs a senior citizen has. Placing your relative in a nursing home can be a difficult decision to make, as many of us are concerned with the quality of life our loved ones will receive and find it hard to put them in the hands of strangers. This decision must be analyzed objectively and ultimately be in the best interest of our senior relatives and the whole family. Safety is most often the primary concern of the family, as there are very unfortunate cases where nursing homes failed to deliver that and were not professional. These cases were addressed and sanctioned, but it’s best to make sure the nursing home you choose is recommended by other people, that the staff communicates openly and the residents are happy. Do your best to visit the relatives you have in a nursing home as often as you can, check on their emotional and physical health and living conditions. Not having enough time, dealing with overwhelming situations or not identifying underlying problems in time can be very stressful on both the patient and the caregiver. Unless you can provide around-the-clock medical home assistance, a nursing home is your best option. In a nursing home, your loved one has around-the-clock professional assistance. Providing that it’s not understaffed, a home will make sure the shifts are reasonable for the employees, so that they are rested and able to provide all the care needed. Someone will always be there in the case of a fall or emergency and will know what to do in that situation. More so, in case of an unexpected situation, more members of the staff can intervene, it’s not just one person who takes care of everything. Another advantage of nursing homes in terms of safety is that all good nursing homes are very careful when hiring their staff and perform background checks on them: any disciplinary issue in their past will be taken into consideration when they are evaluated. Also, a lot of nursing homes require their employees to report any misconduct of their colleagues and keep the environment safe and professional. Think about the well being of your parent, and if they can’t live happily on their own anymore, you should consider safer living environments. It’s not a decision you will make in a day or two, so before making a final decision assess the pros and cons. Ultimately, choose a nursing home that is entirely dedicated to taking care of the elders and there are many ways in which it provides more things than you could provide at home. The enclosure is designed to monitor all the people that go in or out and know at all times when a resident is visited. For residents with Alzheimer’s, making sure you know at all times where they are is crucial, as often they might wander off and get into dangerous situations. Good nursing homes have discreet security technology that does not make the environment feel restrictive, but keeps residents safe without alarming or bothering them. One should also think about the less obvious benefits a senior citizen has when being a resident of a care home. Trained members of staff not only have the medical knowledge to intervene physically, but can also manage agitated or scared residents and calm them down. Experienced nurses know everything there is to know about patients with dementia or Alzheimer’s disease. They will make sure your parents are in good hands, and that their needs and wants are carefully attended. Caring for a relative who suffers from dementia poses significant challenges for the family. Alzheimer’s and other diseases related to cognitive decline or cognitive decline from simple aging is incurable. That being said, if you decide to become a caregiver for a loved one, you should be prepared to face difficulties along the way. However, there are ways to make things better and you can start by improving your own communication skills. This will make the relationship with the patient more tolerable. Body language and attitude communicate feelings and thoughts a lot stronger than actual words. It’s normal for patients struggling with dementia to get depressed every now and then. As their caregiver, you have to be patient with them. Don’t get angry and try not to scream at them or lose your temper. Set up a positive, calm tone of voice and use your gestures to make them feel comfortable . Get their attention and limit noise and other distractions. When caring for a patient with dementia, it’s normal to come across communication issues. At some point, your relative will start forgetting things, and as the condition advances, they may not remember your name and who you are. It’s very important to keep things simple and well-organized. Have pictures, paintings, or favorite possessions on display to make the patient feel safe and comfortable. Your next step is to establish daily routines. Speak as calm as possible, stay calm and use simple words for your loved one to understand. If they misunderstand things, try not to argue with them and keep the tone of your voice down. Even if they don’t remember you, the fact that you’re calm will force their brain into believing everything is ok, and that they’re safe. Most physical disabilities that happen in patients with dementia occur due to falling injuries or strokes. The greater the severity of the problem, the tougher it is for the caregiver to look after their loved one. In order to avoid accidents, it’s best to make your home a safer place to live in. For example, in the bathroom, you can have grab bars installed. You can also place a shower bench and include a rubber carpet too to avoid complicated injuries from falls. Avoid telling your parent that they’re not trying enough or that they could do better. This will only discourage them, and you certainly don’t want that happening because it will affect their mood. It’s fundamental for a caregiver to understand that a patient struggling with dementia won’t be able to perform all the activities that they once performed. To them, life can get boring and empty, not to mention that depression might kick in as well. In case of vision loss , they won’t be able to read anymore; and if they lose their mobility abilities, they won’t be able to move. The Caregiver should focus on providing auditory and visual stimulation. Find a way to make them happy and don’t bring to their attention that there’s something they can’t do. If they can’t see well, take them outside anyway to smell the fresh flowers and hear the birds sing. If they can’t walk, turn to different types of activities such as playing games or reading. Whatever you do, make sure they feel valued and useful . This will keep them happy, entertained and engaged. Last but not least, we have to emphasize that all patients with dementia struggle with confusion and anxiety. These are enhanced at night, so always make sure that they have the light on when they go to bed. Furthermore, if they lose track of time or place, the first thing you need to do is remind them who they are and where they are. This will help them “return to reality” a lot faster. Once again, do it on a calm tone and if you notice that they’re saying incorrect things, change the subject. Find a way to build a pleasant dialogue; talk about interesting subjects and put a smile on their faces. When I was much younger with young children of my own, I ran a daycare center for working Moms. One two-year-old little boy was particularly precocious and spent many long minutes in front of our home Aquarium fish tank. If anything got spilled, broken or turned over– it was usually Jack who got the “time-out” which meant 4 minutes in front of our home fish aquarium. He wasn’t a naughty boy but slow to talk, and even slower to accept the rules of the house. Our large fish tank was filled with colorful fish and shells and air bubbles and lots of other activity most of the time. A few minutes in front of the Fish Tank was little punishment for the small children I babysat, yet it calmed them down and soothed their tears if they were upset. So recently I was not surprised to learn that a Fish Aquarium can do the same for those with Alzheimer’s dementia. Researchers at Purdue University have found that displaying tanks of brightly colored fish may curtail disruptive behaviors and improve eating habits of people with the disease of Alzheimer’s dementia. Folks with Alzheimer’s react calmly to most house pets such as dogs or cats and now it seems that a fish aquarium can offer the same calming affect for those with Alzheimer’s dementia too. If you have no time to care for a dog or cat or other pet, yet have someone with Alzheimer’s in your home, an aquarium with lots of fish and activity may be just what you need. A fish aquarium is alive with color. Besides the fish, the decorations are colorful and offer a soothing affect as water flows and bubbles float. A beautiful fish tank with many colors and flora is as fascinating for adults as it is for children. It can bring a sense of peace and quiet. It can calm an angry person to settle down and watch the quiet and peacefulness of life inside the aquarium. I remember my own Mom could sit and watch the fish for hours, usually laughing and smiling and talking to them. If you have someone in your home with Alzheimer’s dementia who suffers from agitation and is difficult to calm, try adding a Fish aquarium to your home with a comfortable chair nearby. My mom loved the fish aquarium and could watch it for hours, tapping the side and talking to the fish inside. It is an excellent way to end mood swings for the person with dementia. Aquariums come in all sizes. 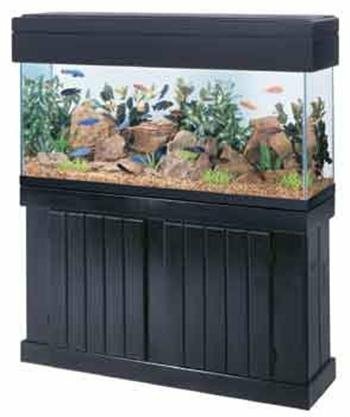 Extra large tanks, such as this one, which can be recessed into the wall and makes a stunning presentation for the gorgeous fish that are available nowadays. Yet a moderate size fish tank is just as satisfying for the person with Alzheimer’s dementia. The attraction is the fish and all the activity happening in the tank. Yet a moderate size fish tank is just as satisfying for the person with Alzheimer’s dementia. Their fascination is with the fish and activity inside the tank. When my Mom had Alzheimer’s, Sundowners Syndrome could make bedtime a nightmare. Late evening was a dreaded time for my Mom. Some evenings she would fall asleep as soon as her head hit the pillow. But, more often than not she would begin to cry only hours before bed time. A gentle weeping at first would turn into a very sad, groan then escalate to a loud sobbing wail that filled the house. It didn’t happen every night, but it happened often enough to ask the doctor if there was something wrong and what on earth could I do. Some antidepressants cause anxiety and irritation and keep them awake rather than help them to sleep. Mom seldom took more than a mild antidepressant at night as we hoped for a sound and restful sleep. Despite all our efforts, several nights a week Sundowners Syndrome haunted Mom. Her wailing cry was unnerving. It almost sounded like someone in horrific emotional pain. If you’ve ever heard a mother weep from the death of a child, that is exactly how my Mom sounded on many nights. She wouldn’t walk or flail, but sit on the side of the bed and weep into the darkness. Mom took a light medication to help her sleep, but remained alert during the day. Most often, she had really good days, it was only the evening hours that brought nightmares while she was wide awake. Some behaviors during Sundowners include: shouting, wandering, expressing fear, sadness, crying and anxiety. Since the cause of Sundowners is unknown, many think it might have something to do with the body’s natural cycle or Circadian Rhythms (natural sleep/wake cycle.) The longer they’ve had dementia, the deeper is their confusion. It seems to occur as they begin to sleep more and stay awake less. Touch-base with their doctor. Let them know about the issue and ask for suggestions, perhaps a light sedative– or check on the medications they are already taking, could one of them be keeping them awake? All the best to those caring for someone with Sundowners Syndrome. If you find something that helps or would like to share something you’ve learned, comment below. We’d love to hear from you.